I’ve been trying for several weeks to change the color of the stuffed elephant by fiddling with various adjustment layers to no avail. The elephant had light shining through its ear causing a strange glow and the adjustment layers never looked good. Once again, my bookshelf came to the rescue. I was flipping through one of my books called, The Hidden Power of Blend Modes in Adobe Photoshop by Scott Valentine. I was trying out various techniques that looked interesting when I came across one that made a light bulb go off in my head… “It’s so crazy it just might work!”. I’m going to try to keep the how-to simple this week, last week’s tutorial got away from me and became huge. I took last week’s image and removed two layers… the gray layer that made it black and white, and the hue/saturation layer that changed the colors to wild. Leaving me with three curve layers that forced the viewer’s eyes to go where I wanted. Then I combined those into one layer [ctrl-alt-shift-E]. Then I started working on the elephant. I went through various shades of blue using the same technique as the wall. A new layer filled with color and the blend mode set to COLOR. And a mask layer for control of what was visible…. but it just wasn’t quite right… the elephant always seemed to glow. The grayscale layer also allowed me to remove some of the pink reflection that was on her paw and stomach. So I started to play around with blend modes and found that MULTIPLY was the one that worked best. I also fiddled around with opacity and fill percentages to get a blue I liked.. Note that I’ve labeled each layer with which color mode I used. I have a few ideas for next week… we’ll see if they actually work out! 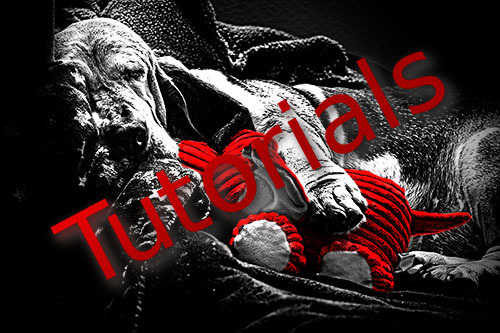 This entry was posted in one four challenge, pet photography, photoshop, tutorial and tagged basset hound, dog, one four challenge, photography, post processing. Bookmark the permalink. The final wash of blue was a thoughtful addition to the overall effect. I love the different shades of blue here. I really like this version – making the elephant blue, gives the whole image a harmonious feel. Thanks, Robyn! I’m really liking the blue version too. Great job, sounds pretty technical too. I loved the purple version but this blue one works so well, and I love how its a really diff shade of blue from the blankets.